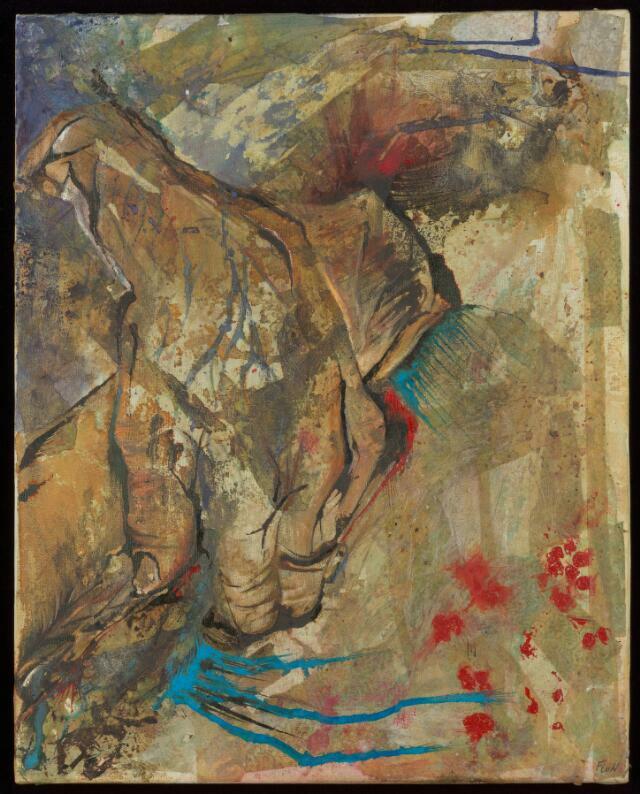 A study of the artists grandmother's hands, folded in her lap. The artist's grandmother suffers from Alzheimer's, and this painting was created shortly after 'Mama' moved to a nursing home, after her Alzheimer's disease progressed to a stage where could no longer look after herself. "She lost a lot of weight, and a broad, strong, matriarch became a feeble, bird-like woman. Yet however small her frame became, her hands remained large and strong and capable." 'Mania' expresses the dementia Mama experiences, also reflected in the fragmented shapes and background of the painting; an atmosphere reflecting the nightmares she described earlier on in the process of losing her mind, when she was still able to explain it. Mania, also relates to the Latin roots of the word for hand. The relaxed pose of her hands in the picture alludes to the way the body can settle and remain hardy, even when the mind has become chaotic.